Message:Hi Dessie1. 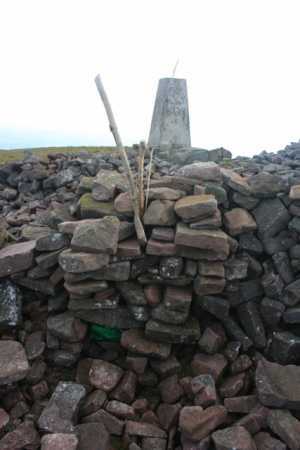 In relation to your idea to have some type of register on top of summits; I was on Temple Hill in the Galtees last week and there was a piece of wood sticking out of the cairn with a message on it saying “sign the book” with an arrow pointing down. I rummaged around and found a plastic bag in a recess near the base of the cairn. In the plastic bag was a metal tin, with another plastic bag inside. And another plastic bag inside that! I eventually found a decent diary, with a page available for each day. Anyone who wanted to sign the book just found the current day and filled it in with the time and a message. There were several other entries in it for that very day (Sunday 26th September). I added in my own piece and mentioned MountainViews too. It was interesting to see that so many others had been up before me that day as I had seen no one else in my few hours walking. But I don’t know what the register was for, who owns it, or what they will do with the information within. There are a few awkward questions to be considered when proposing a national mountaintop register system. Let me throw them out and we can see what people think. 1 Who would put registers on top of the mountains and hills – 1055 summits currently listed on MountainViews! 2 What would we do with the registers? 4 How do we get registers onto the generally inaccessible summits such as An Tiaracht and Puffin Island? 5 Would the registers be an accurate reflection of all those who climbed the hill as many wouldn’t sign, especially in terrible weather, or as soon as the pen runs dry (or runs away)? 6 This being Ireland, the registers probably wouldn’t last long before they’re stolen, vandalised or blown away. How do we manage this? I think the idea of having a way for people to log having climbed a hill and having the opportunity to write about it is exactly what MountainViews offers. And unlike a paper book on the summit, MountainViews won’t get ruined by Irish weather or vandals!